Home › Knitting › Snowflakes and Drop Bears? Apologies for not posting anything last week – I decided to start a second big project and had nothing to really show without digging through the archives, and with everything going on at the moment…yeah…didn’t happen. However! I have a finished a project (three technically) and an amusing anecdote to make up for it! 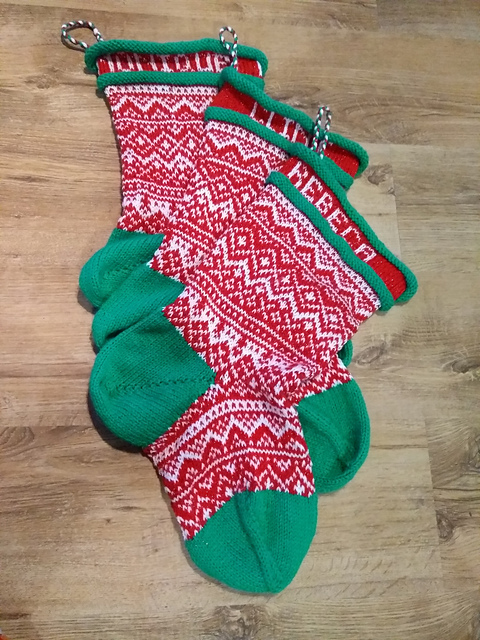 After a bit we decided on personalized Christmas stockings – they could hold the presents, be used year in and out, would serve as a nice reminder and it didn’t really matter if they matched the decor or not as it was a Christmas decoration. Me: They need to look really nice and traditional, classy. Engel: They should have Drop Bears on them! Engel: Drop Bears wearing monocles! Me: Which part of ‘traditional and classy’ did you not understand? Beautiful stockings! I can see those being well loved and used year after year!